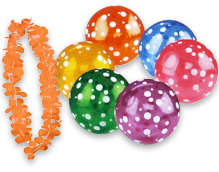 Leis, Beach Balls, Gift Bags & More. Hawaiian luau parties are so much fun. Exotic scenery, delicious and delectable tropical eats and drink--and they can be had just about anywhere! Be sure that your luau guests get to take home a little bit of the Pacific with them with unique luau supplies and party favors from 1SuperParty. We have silk flower leis, luau and tiki-themed accessories, and more to choose. They even make great handouts for Summertime beach parties! Find the right accessories, decor, favors, and party handouts for your next Hawaiian luau bash at 1SuperParty.